Thank you for supporting the Vimy Foundation. Please select how you would like to direct your donation: to our general programming, supporting all of our work to build awareness of Canada’s First World War legacy; to Vimy Legacy Fund, which supports our Vimy Pilgrimage Award; or to Give a Vimy for Vimy, supporting our Vimy 2017 centennial campaign. Help support the Vimy Foundation's general programs to build awareness about Canada’s role in the First World War. Your monthly donation to our general programming allows us to plan for the year ahead, and the flexibility to direct your donation to our ongoing programs. 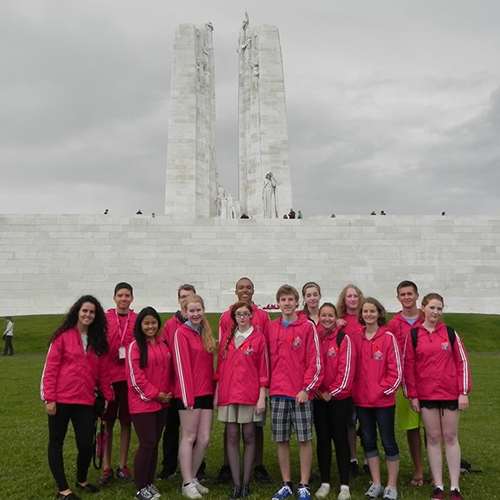 Help us fund our Vimy Pilgrimage Award, which sends 20 outstanding young Canadians walk through the footsteps of history in Canada’s most notable First World War sites each April. Donate a ‘Vimy’ – the Canadian $20 – to support our 2017 campaign, commemorating the centennial anniversary of the Battle of Vimy Ridge. Be a part of the Vimy Legacy, help support the Vimy Foundation’s Centennial Park adjacent to the Vimy Memorial in France. The park will consist of 100 Oak trees – descendants of acorns collected at Vimy Ridge. Plant a Commemorative Vimy Oak tree in Canada, in support of the Vimy Foundation Centennial Park. At the Vimy Foundation we are dedicated to creating opportunities for young Canadians to learn about our First World War legacy, as symbolized with the victory at Vimy nearly 100 years ago. That’s why we develop education programs such as the Beaverbrook Vimy Prize, the Vimy Pilgrimage Award, and the Vimy Ridge Week at Encounters with Canada, to help youth learn more about the sacrifices made by an entire generation 100 years ago –a time when Canada became a nation. The Vimy Foundation raises funds for its educational youth-oriented initiatives thanks to the generous contributions of private donors, corporate/municipal sponsors and participating schools, as well as Vimy Pilgrimage Medal and Vimy Pin sales. The Foundation actively seeks your support. Donors can receive a tax benefit, since the Foundation is a registered charity under the Income Tax Act. We are able to issue tax receipts for any donation over $10, and the federal government has eliminated capital gains tax when you donate publicly listed securities to official charities like the Vimy Foundation. Please contact us directly at 514.904.1007 if you are interested in discussing different options to help you achieve your philanthropic goals.